Masuwe Lodge combines the best of both worlds - the splendour of Victoria Falls & the mighty Zambezi River with safari life. It’s time to live your African dream. Masuwe Lodge opened its doors in 1992 as the flag-ship lodge of Landela Safaris, a company owned and operated by local Zimbabwean couple Stewart and Sally Cranswick. Under the guidance of General Manager, Jonathan Elway it quickly became a firm favourite on the Landela Safari circuit which included lodges in Harare, Hwange National Park and Kariba. In 2002 Landela Safaris wound down its operations in Zimbabwe and Masuwe Lodge was packed up and closed. For the last 15 years, the gardens and the old stone buildings have been in the care of Farai Mukaro and his team, all of whom are excited to welcome guests back to Masuwe. Masuwe Lodge reopened in May 2017 after a total re-build and re-furbish. We have taken the lodge right back to the skeleton … and then some! One thing we have not changed is the names of the tented rooms; each is named after a bird, those that Stewart and Sally first saw on their first visit to Masuwe. 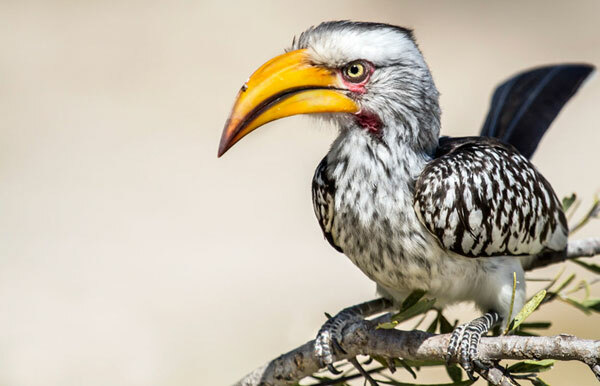 And yes there is a Hornbill, hence the photo of “Zazu” here … we see them around the Lodge every day. There is something very special about Masuwe – a positive energy made up of the breeze in the trees, views of the bush, the huge open sky and wildlife all around. At Masuwe, every day holds a little bit of memory-making magic! Whilst Masuwe Lodge re-opened on 01 May 2017, the Masuwe team have accumulated over 100 years of experience in the safari lodge business. You can rest assured we will deliver what we are promising!